The photoconductivity of high-resistivity insulating crystals is estimated in Ref. 1 from measurements of the Maxwellian relaxation time. The photoconductivity of high-resistivity crystals can then be found by a contactless method, which is very desirable because the conventional methods are difficult. A laser beam is formed into an elliptic spot1 with its major axis perpendicular to an external electric field applied along the x axis, normal to the optic axis of the crystal z. The beam direction is parallel to the z axis. The problem of screening of the external field is solved in Ref. 1 for the situation when an elliptic spot reduces to a rectangular strip, which can be regarded as the limiting case of an ellipse. We shall solve the problem of the screening of an external electric field in the case of a homogeneously illuminated elliptical spot oriented in various ways relative to the external field. We shall show that the Maxwellian relaxation time differs very considerably for the cases when the major axis of the ellipse is perpendicular and parallel to the electric field. FIG. 1. 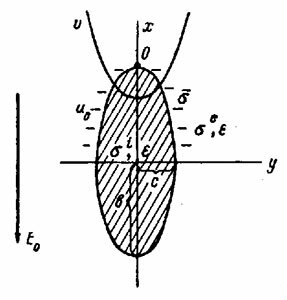 Major axis of an elliptic illuminated spot perpendicular to an external electric field E0. FIG. 2. 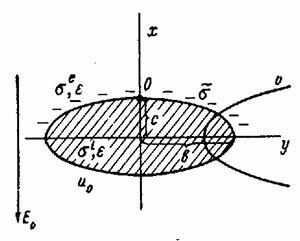 Major axis of an elliptic illuminated spot parallel to an external electric field E0. which is written down for the points denoted by o in Figs. 1 and 2. The case of a circular spot is obtained by assuming b = c in Eq. (11), and it is also described by Eq. (8). It follows that the time to establish a screening charge depends strongly on the ratio of the semiaxes of the ellipse. When the major axis of an elliptic spot is perpendicular to the electric field and also if , this time is equal to the Maxwellian relaxation time of a homogeneous medium whose conductivity is . However, if the major axis of the ellipse is directed along the electric field and if , the time is equal to the Maxwellian relaxation time for a homogeneous medium whose conductivity is . The author is grateful to A. P. Levanyuk, V. A. Pashkov, and N. M. Solov'eva for a valuable discussion of the topics considered here, and also to Kh. S. Bagdasarov for his encouragement. 1V. A. Pashkov, N. M. Solov'eva, and E. M. Uyukin, Fiz. Tverd. Tela (Leningrad) 21. 1879 (1979) [Sov. Phys. Solid State 21,1079 (1979)]. 2L. D. Landau and E. M. Lifshitz, Electrodynamics of Continuous Media, Pergamon Press, Oxford (1960). 3 G. Arfken, Mathematical Methods for Physicists, Academic Press, New York (1966).